Detail from the cover of Shazam! #1. As DC Comics has transmogrified over the last 20 years, Geoff Johns has been at the very center of—or, at least, extremely close to—the engines of change. His title is different nowadays, but he’s still going to be working on deepening interpretations of the company’s iconic characters. The former president and chief creative officer of DC Entertainment isn’t an executive anymore. Geoff Johns is getting back in the trenches as a writer and producer of comics and TV, and he revealed details about all the projects he’s working on in the interview that follows. In particular, he talks about writing an emotional mystery built around the Joker, the appeal of the Shazam mythos, and what he wants to do with the Stargirl TV show. io9: You’re transitioning from chief creative officer role of DC Entertainment to more of a writer-producer role. Was there anything about your time as a CCO that made you want to get back into writing? io9: A guy who’s giving notes. Johns: Yeah, I don’t want to give notes anymore. I want to get notes. You know what I mean? I want to get notes. Because... I want to do more on less, really. io9: Everything you’ve done in comics before has been a mix of science and magic. 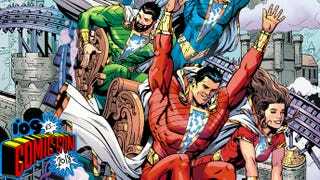 Having touched the character and his mythos before, how do you want to expand on the idea of what magic means in the new Shazam! series you’re working on? Johns: Yeah, well, part of it is the diversity I like to attack. Doomsday Clock is very different from Three Jokers, and that’s very different than Shazam, tonally. Same thing with Stargirl and Titans and Wonder Woman and they just shot Shazam!, the movie. But with Shazam!, specifically, I always loved Roald Dahl, The Phantom Tollbooth, and The Lion, the Witch & The Wardrobe. The full cover of Shazam! #1. I loved those books where a group of kids, or a kid, discover worlds that are beyond our world and meet crazy characters, like Alice in Wonderland and The Wizard of Oz. I wanted to inject all that into a superhero book, because it feels new and unique to me. So, I came up with the idea that there’s seven realms of magic that are all connected by the Rock of Eternity, and [Billy Batson and his friends] will explore those realms. Uncovering the ideas and mythologies and characters, just cracking open a magical corner of the DC universe that’s never been seen that’s more fun, more bright and colorful—with some danger to it. I’m trying to do something in the tone and the style of, “If the Fawcett comics had continued to evolve over the decades, here’s where they’d evolve to.” There’s a real charm to the old Captain Marvel books. Specifically, there’s a cover I love where Captain Marvel and Mary Marvel are flying with Santa Claus. I want to do stuff where, if we did a cover like that, which we’re going to, it fits right in with the rest of the book. That’s what this book and world is. It makes Shazam! different from every other book on the stands, every other character on the stands, every book I’m working on. I’m excited about it; when I get to go to Shazam’s world, it’s brand new. And it’s still tapping at all the emotional storytelling of finding and building a family that you’re not born with. It’s about bond, not blood, which is really important, because it’s the truest superpower that Shazam has. He can share his power with anyone he deems family. And then I’m going to explore what happens when the family he’s finally embraced might be cracked apart by outside forces. There’s going to be all these different layers to the story. The storytelling will probably be denser than normal, because I want to feel like those great books where you’re going in different worlds with kids, where there’s an unknown, magical feeling to it. io9: Will Black Adam be in Shazam!? Johns: Eventually, yes. There’s stuff that happens. Black Adam’s a pretty major player in Doomsday Clock, and eventually he and Shazam will cross paths. Eventually. io9: So, in your mind, Doomsday Clock shares connective tissue between the two projects? Johns: There’s some connective tissue, but I’d say it’s not, like, literal. Johns: Yeah, it’s not really that, necessarily. I mean, they’ll connect, but Doomsday Clock takes place a little bit in the future. io9: The seven realms you’re going to have Billy and everybody explore, are they all realms that are going to be new? Are they realms that we’ve seen before in the DC universe? Johns: All brand new. Except one, our Earth. io9: Well, there’s magic on our Earth. Fair enough. Moving on to Three Jokers, you said on the panel that there’s not going to be alternate reality tricks or time travel or anything like that—so, is this an idea of how the Joker’s personality and methodology has evolved over time? A trio of Clown Princes of Crime bedevil Batman on the cover of Three Jokers #1. Johns: Yeah, it’s basically in continuity, even though it’s Black Label. If you look at the differences between how they reacted to [those encounters], very different, right? Barbara got stronger, Jason got more violent. Johns: And Bruce, did he change or not change? io9: If you talk about what happened to Jason, he certainly changed. He became harder. And that leads me to another question: You’re tackling Batman, a character you’ve rarely written before, at least in a solo setting. What makes what you’re going to do different than say, what you did on Batman: Earth One? Johns: I’d say Batman: Earth One is kind of a reinvention of a younger Batman and his whole world is different. Volume three is actually underway; Gary’s drawn a hundred pages already of volume three. He’s got like, 45 left to do, and he’ll be done. And that continues to build off this kind of new, more grounded version, where Alfred’s more blue-collar. It’s a much more rolled-back and scaled-back world. Whereas Three Jokers is embracing everything that’s kind of in the mainstream, just like Alan [Moore] did when he did Killing Joke. That took place right in the continuity. We’re doing the same thing. We’re telling the story with where the Batman family is right now at this moment. io9: That said, have you caught up on the current status quo? I mean, you’re a person who doesn’t necessarily have to do that. But James Tynion, for example, did interesting stuff in the family dynamics in Detective with Tim Drake. Scott Snyder obviously left his mark and Tom King’s doing compelling work in Gotham. Are you going to reference any of this as far as where Batman is now? Johns: I don’t know if, necessarily, it’ll be a puzzle piece. I think where the piece fits will be up to the readers where that fits. io9: Switching gears to Stargirl, she’s obviously a character that’s always been very close to your heart. I really liked how you used her in your JSA run. Johns: Thanks. Then you’ll like the show. It’s basically Star and S.T.R.I.P.E. meets the Justice Society. But it’s younger. io9: So, as far as a backdrop, when you say Justice Society, are these the World War II characters? Johns: Well, I don’t want to spoil it too much...but say, the JSA, to me, is about legacy. History gets remembered on an unlettered preview page from Johns’ run on JSA. io9: Okay, fair. So, Courtney, when we meet her, is discovering her stepdad’s secret life. It’s the same framework as Stars and S.T.R.I.P.E.? io9: What are you changing this time around? Johns: Well, the comics are the starting place, but it’s really a re-imagining of her origin and connection with the Justice Society. And a re-imagining of the re-introduction of the Justice Society. It’s like, if you’re going to pick up the legacy of a superhero today, what would you do? io9: There was a guy who used to run around in a fedora and a gas mask and put people to sleep. Would that would work now? Johns: Yeah. What would you do now? And why would you have to do it? But tonally, it’s a very Spider-Man: Homecoming or Cobra Kai—it’s going to be a really fun show. A lot of humor. An homage to the Golden Age on a latter-day Justice Society cover. io9: I’ve always been a huge Justice Society fan. I loved All-Star Squadron back in the ‘80s...how do you feel like the potential audience will receive DC characters that tie back to some stuff that might feel old-fashioned, or outdated? Like, Liberty Belle is a hard sell, man. Johns: Yeah, but I’ve kind of made my career off selling characters with names like Booster Gold and Aquaman, so I’m not really worried about it. That’s the least of my worries. I’m worried more about budget and production then I am about, “Will we be able to create a version of Hourman that people could relate to?” Absolutely. I have no question. No problem about that. io9: You mentioned Hourman…can you get into specific characters you want to touch? Johns: I don’t want to get into specifics. It’s a bit early to get into specific characters. io9: Fair. Do you have a roster? Johns: Yeah, it’s already been planned out. Whole first season. io9: Talk to me what’s different about planning a show like this for a streaming service, compared to Smallville or The Flash. Johns: No commercial breaks, which is a lot of fun. The timing doesn’t have to be like a broadcast show. There’s no specific time the episode has to be; we have flexibility. That’s awesome, because we can just cut the best version of the episode. There’s certain structural stuff we don’t have to worry about. In the case of things like Titans and Doom Patrol, there’s ratings we don’t have to worry about. Stargirl will be a different kind of show, which I love. We should have something for everybody. The storytelling will be different, probably a little slower and more character-driven. I don’t want to do supervillain-of-the-week, that’s not what Stargirl is about. It’s a thirteen-hour movie about the rebirth of the Justice Society. io9: You can’t talk about Stargirl and her powers without talking about Ted Knight, Jack Knight, and the Starman legacy? Can we expect to see any of that in the show?